Snoqualmie Pass is a mountain pass that allows travelers on Interstate 90 to make it through the Cascade Range of mountains in the state of Washington. Along with Stevens Pass and White Pass, Snoqualmie Pass is one of three east-west mountain passes in Washington State, and thousands of vehicles use it each and every day. The pass is located in the central part of Washington State about 50 miles away from the city of Seattle. Snoqualmie Pass is also the name given to a census designated place along the pass with a population of just a few hundred people and an area of 2.9 square miles. Snoqualmie Pass was named after the Snoqualmie indigenous people who live in the Pacific Northwest. Native Americans used the pass for centuries before European settlers arrived in the area. 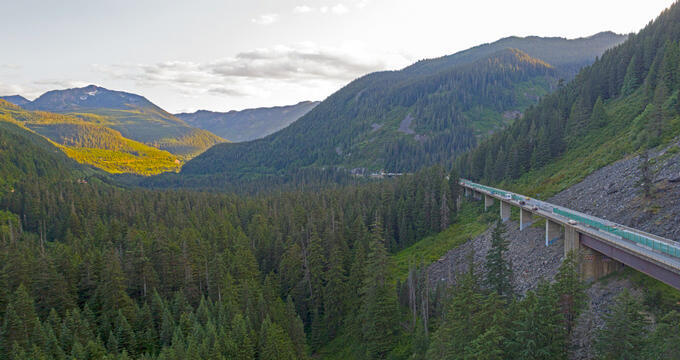 Throughout the mid to late-19th century, the pass was explored and surveyed by various groups, eventually leading to the construction of a railroad through Snoqualmie Pass in 1909, but this was retired in 1980. United States Route 10 used to run through the pass, but was replaced by Interstate 90 in 1969. Nowadays, the area around Snoqualmie Pass is filled with various vacation chalets that are mostly used for skiing and other winter activities. The nearby Summit at Snoqualmie area offers four different ski areas: Summit West, Summit Central, Summit East, and Alpental. This is the closest skiing destination to the city of Seattle and receives many visitors from the city each year. Other activities that can be enjoyed in and around Snoqualmie pass include climbing, hiking, and even hang-gliding. The elevation of a location tells us how high or low it is in relation to sea level. It's an important geographical statistic and can have an influence on many things like wildlife and weather conditions. The summit of Snoqualmie Pass has an elevation of 3,015 feet (919 m), which means it has the lowest elevation of the three east-west mountain passes in the state. White Pass has an elevation of 4,500 feet (1,372 m), while Stevens Pass has an elevation of 4,061 feet (1,238 m). Key locations around the area include the Snoqualmie Tunnel, which has an approximate elevation of 2,600 feet (790 m) and the census designated place of Snoqualmie Pass which has an elevation of 2,726 feet (831 m). Some of the largest mountains in the surrounding area include Mt Baker to the north, which has an elevation of 10,781 feet (3,286 m) and Mount Rainier to the south, which has an elevation of 14,411 feet (4,392 m). The high elevation of Snoqualmie Pass has a large effect on the area's climate. Compared with the nearby major city of Seattle, Snoqualmie Pass has much lower temperatures and huge amounts of snowfall. Temperatures can drop below freezing point for long periods of the year and the area receives more than 400 inches of snowfall each year. The extreme weather conditions in the area can make Snoqualmie Pass a treacherous spot to traverse, with snow chains often being necessary. The coldest month of the year in Snoqualmie Pass tends to be January, which sees average highs of 32°F (0°C) and lows of 21°F (-6°C), while the warmest time of year is in July, with average highs of 70°F (21°C) and lows of around 46°F (8°C). When compared to the rest of the state of Washington, Snoqualmie Pass’ elevation is relatively high. Washington is a relatively low-lying state on average, despite the presence of several mountains, with a mean elevation of 1,700 feet (520 m). The highest point in the state is the aforementioned Mount Rainier, which is also the highest mountain in the Cascade Range in the Pacific Northwest and has an elevation of 14,417 feet (4,394 m). The lowest point in the state of Washington is the Pacific Ocean, which is at sea level. The highest incorporated town in the state of Washington is Waterville, which is located in Douglas County and has an elevation of 2,622 feet (799 m). Major cities around the state tend to have relatively low elevations. Some examples include Seattle, which has an average elevation of around 170 feet (52 m), Tacoma, which has an elevation of 243 feet (74 m), and Vancouver, which has an elevation of 171 feet (52 m). Spokane is one notable exception, with this city sitting at a relatively high elevation of 1,843 feet (562 m).